On Wednesday, December 28, All Romance eBooks--a romance-specific ebook distributor and publisher that also distributes general fiction and nonfiction through its OmniLit imprint--dropped a bombshell. In mass emails to customers and authors, ARe's owner, Lori James, revealed that her company was closing, and that in lieu of full payment, authors and publishers would be offered a fraction of what they were owed. The exact why of the ARe closing remains a mystery (the emails make generic references to losses and poor financial forecasts, but provide no specifics). As to the what, here's what we know so far. - The ARe website is going dark at midnight on December 31, 2016. Customers were given just four days to use their credits, download their purchases, and backup their libraries. Authors were given just four days to decide whether to accept ARe's offers of "settlement". - ARe is offering just 10 cents on the dollar to authors whose books it distributed. Per the email, "We will be unable to remit Q4 2016 commissions in full and are proposing a settlement of 10 cents on the dollar (USD) for payments received through 27 December 2016." - ARe is offering no payment at all--zip, zero--to authors whose books it published. In a different email, published authors are offered rights reversion on condition that they consider this "a negotiated settlement of your account to be 'paid in full'. - In order to receive these settlements, ARe is requiring authors to waive their right to pursue legal redress. They must agree that "no further legal action be taken with regards to the above referenced commissions owed." - ARe is staying open until December 31, but is offering settlement only on payments received through December 27. Romance Writers of America, in a statement on the closing, calls this four-day no-payment zone "unconscionable." - ARe is saying nothing--publicly at least--about reimbursing 2017 advertising purchases. Just days before the closure announcement, ARe sent out an email soliciting ad buys. Many authors took advantage, or had already bought ads. - ARe is doing all of this because, it claims, it wants to avoid filing for bankruptcy. "It is [our] sincere hope that we will be able to settle this account and avoid filing for bankruptcy, which would undoubtedly be a prolonged and costly process." Yes, it would--and it would also make ARe accountable to its creditors. I've been contacted by a lot of ARe authors over the past couple of days. By all accounts, the company's implosion came completely out of the blue. Some authors did tell me that they'd noticed sales declines and ad price increases over the past year, but others saw their sales go up, and there were none of the classic warning signs--no late payments, no payment errors, no communications problems, no website glitches. Until Wednesday, ARe authors and customers had no reason to suspect there was anything wrong. It looks like there is a lot of money involved. ARe claims close to 1.2 million titles across its two retail sites, and works with hundreds of publishers as well as individual authors. A few authors told me that they are owed relatively little--less than $100--but the majority of those I heard from are owed in the hundreds and thousands of dollars. For many, ARe was their largest source of sales after Amazon. I've also heard from a publisher that used ARe to distribute its books; it told me that it is owed five figures, and is planning on making its affected authors whole out of its own pocket. A number of other publishers are reportedly planning to do the same. It's worth remembering that editors and other staff are caught up in the implosion too. As are readers, whom ARe will not reimburse for purchases or pre-orders. Some authors and publishers are offering to honor pre-orders or purchases themselves, for readers who send them receipts. Many of the authors who've emailed me plan on refusing ARe's settlement offer on principle--even if it means they get nothing, or risk having their ARe-published titles assigned to another publisher, as Lori James has apparently said she may do. On a private Facebook group, ARe refugees are talking, among other things, about the possibility of legal action. So what to think about all this? Even if we give ARe the benefit of the doubt--assume it is really in dire financial straits, and that its pennies-on-the-dollar offer is a good faith effort to provide at least some payment, rather than to stockpile cash by lowballing authors--it has handled the situation in a notably arrogant and unprofessional manner. I'm reminded of Booktrope, which also went out of business abruptly with few signs of trouble beforehand, leaving its authors high and dry--but Booktrope at least gave authors and customers a month to tie things up. Can we give ARe the benefit of the doubt, though, considering that it's proposing to pay its published authors nothing (this, which hasn't been much noted in the general outcry, is for me one of the most disgraceful aspects of the whole affair), appears to be ignoring the issue of ad buy reimbursement, is expecting authors to waive their right to legal redress without knowing any of the reasons behind the closing, and is giving them less than a week decide whether to say yes or no? Not to mention that troubling four-day gap during which ARe will continue to sell books, but will not remit payment. I am not saying there is dishonest intent here. We don't know that. But the lack of professionalism and care is really troubling. ARe authors are collecting data on money owed to authors and publishers. You can fill out a survey here. You can see results here; amounts range from less than $5 to more than $14,000. UPDATE: SFWA members with books at ARe are urged to contact Griefcom at griefcom@sfwa org. UPDATE 12/30/16: I don't know what this means, or if it means anything, but in March 2015, ARe co-owner and CFO Barbara Perfetti sued Lori James for a variety of causes, including breach of fiduciary duty and unjust enrichment, alleging that James had improperly forced her out of the company in November 2014. Among other things, Perfetti alleged that James started paying herself a salary shortly after Perfetti was locked out of the company (previously, Perfetti and James had taken distributions, but had not drawn salaries). According to court records, James never responded to Perfetti's complaint, and the case was dismissed in August 2016 for lack of prosecution. The complaint can be seen here. To see the full court record, click here, select All Case Records Search, and enter the plaintiff's name: Barbara Anne Ulmer. UPDATE 1/2/17: Just days before the closure announcement, Lori James contacted multiple ARe authors with an offer to market their foreign and audio rights (another "click here if you agree" email), and was also contacting agents about representing those rights at book fairs. These really don't seem like the actions of a company on the verge of shutting down. Curiouser and curiouser. UPDATE 1/3/17: At least some authors report receiving full refunds for 2017 ad purchases. And the story has spread beyond the writing/publishing community: the Guardian did an article today. UPDATE 1/14/17: A class action lawsuit on behalf of writers and publishers has been filed in the Circuit Court in Pinellas County, Florida, against All Romance eBooks and its owner, Lori James, by the law firm of Byrd Campbell P.A. The press release is below; you can read the complaint here. UPDATE 1/23/17: The Tampa Bay Times covers the ARe story. David Vandagriff, a Utah lawyer who represents writers around the world (none selling on All Romance), said...authors are probably out of luck if they think James was legally obligated to avoid commingling royalties with business accounts. "That would certainly be a good business practice," he said. "But it's not required. "What happens in these cases, the owners have a good quarter, so they assume the next quarter is going to be as good or better and they pre-spend money they don't have yet," he said, acknowledging he has no firsthand information on All Romance. I wanted to take this opportunity to update all contracted publishers on some key elements involving the winding down of All Romance eBooks, LLC. First, we have completed the process of refunding all 2017 Pre-orders and Advertising. Next, all book files and images have been deleted. On Saturday, February 4, 2017 the remaining server content will be wiped. Once the server content is erased, you will no longer have access to the publisher portal (https://www.allromanceebooks.com/publishers/index.php). Please make sure to log in and download any reports you might need prior to that date. We remain on schedule to remit payments by February 28, 2017 of payment of the settlement amounts for those who agreed to accept our 10 % settlement offer. Finally, those who are due to receive a 1099 for the 2016 tax year will be receiving them via the post. Those who are due to receive a 1042 for the 2016 tax year will be receiving password-protected files via email. We will be sending a password protected document to the email address we have on record. The password to unlock the document will be sent via a separate email. As per our terms of agreement, we will be using the information that was in our database as of December 31, 2016. If you need to update any information for the 2017 tax form distribution, please send a request to allromanceebooks@mac.com. UPDATE 9/25/17: Recently spotted: re-issues of some of Lori James's books (under pen names Samantha Sommersby and L.J. Harper) through a publisher called Morpho Press LLC. Morpho has no website, but a business entity search shows that it is registered in Sheridan, Wyoming by Cloud Peak Law Group, P.C. 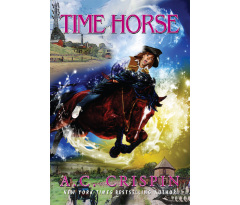 Over at The Writers Workshop, Harry Bingham is taking a look at UK-based vanity publisher Austin Macauley. Are they legit? Or are they scammers? I don’t know. I honestly have no idea. But I’ve heard some concerns raised about the firm and I think the fairest thing to do is ask the question. If it turns out that the firm is an honourable one, seeking to do the very best for its authors, then fair play to them. I will take this post down and offer the WW as a platform for the firm to market itself. I will make it absolutely clear that we have no bad word to say about them, in public or in private. And if they’re scammers – well, then, I hope they perish. I hope they perish soon. And I hope that those responsible for the company are deeply injured, financially and reputationally, by that collapse. To try and solve this conundrum, Harry has formulated a list of questions that he has invited AM to answer. Question 1: What proportion of AM’s titles are ‘traditional mainstream’ and what proportion are via ‘partnership agreement’? This is an important question. AM does reveal on its website that it offers "contributory" contracts (using the newly trendy euphemism, "hybrid," to describe its publishing model), but it also presents itself as an "innovative independent trade publisher" and states that "we look at every new manuscript with a view to offering a traditional mainstream publishing deal." This certainly encourages authors to believe that they have a good chance of a traditional offer. But do they? Writer Beware has heard from just four authors who were offered contracts they didn't have to pay for. By contrast, we've gotten 60+ reports from authors who received fee-based offers (along with lots and lots of inquiries about AM's reputation and business practices; it's one of the publishers we receive the most questions about). Now, I'm sure that the writers who've contacted me represent only a fraction of those who've submitted to AM. Even so, the proportion of fee offers to no-fee offers does suggest--to me, at least--that the bulk of AM's business is pay-to-play. You can see many many many many many many other author reports of Austin Macauley's fees online. Question 3: What is the median cost to the author of these partnership agreements? Fees in contracts Writer Beware has seen range from £1,275 to £7,700 (the heading of fee disclosure section is "Advances," except that this is an "advance" the author has to pay the publisher). Some authors are offered a choice of fees depending on which book formats they pick. I've also seen a number of AM's acceptance letters. There are differences depending on the rationale for offering "contributory" contracts (new author, can't take the risk; previously published author, not successful enough) but other than that it's clearly cut-and-paste, with whole passages used verbatim in multiple letters. Question 4: Partnership implies some joint sharing of risks and rewards. So, do you contribute a sum broadly equivalent to that contributed by your authors? If, for example, your launch costs for a book are expected to be £6,000, do you ask the author for £3,000 and contribute the other support yourselves? And if not, then, please, how does it work? Obviously, I can't answer for Austin Macauley, nor would I attempt to do so. Speaking generally, however, many pay-to-play publishers promise or imply that they are contributing part or most of the expense, and the author fee is just a portion--but in fact, what authors pay is far more likely to cover not just the whole cost of publication, but the publisher's overhead and profit as well. Also, since fee-based publishers' profit typically comes primarily from author fees and book purchases, rather than from book sales to the public, most have little reason to invest in professional-quality editing, marketing, and distribution. In fact, they have substantial incentive to skimp on these things, since they reduce profit. We would like to be as transparent as possible in answering your questions. However, as I am sure you understand, many of the details you ask for could potentially require us to break confidentiality, in terms of both our business and of our authors. We plan to discuss these issues fully with Austin Macauley’s lawyers, who will tell us precisely how much information we are able to divulge to you. Color me unimpressed. I can kinda sorta maybe understand that AM might not want to spotlight particular authors (though if their books are bestsellers, I doubt they'd mind)--but there's no confidentiality attached to most of the information Harry is asking for. Other publishers have no problem providing public information about sales and revenue. Harry isn't impressed, either. He sums up his opinion in a followup blog post, concluding: "I think [Austin Macauley] is a vanity publisher that trades on the legitimate hopes and excusable ignorance of its clients...if you’re considering entering into a partnership agreement with Austin Macauley, then don’t. Just don’t." AM's listing with Companies House is here. You can see AM's latest unaudited abbreviated financial statement here (have a look at the final page). Also, just for fun, compare AM's history of officers with that of Ashwell Publishing. Ashwell Publishing does business as Olympia Publishers, another pay-to-play outfit. Coming to America! AM is UK-based, but it is expanding into the USA. It has a glitzy new US website, and a brand new office in New York City--a virtual office, that is, on the 28th floor of 40 Wall Street. Basically, a PO box. (Am I alone in finding it hilarious that this is a Trump-owned building?) Just 73 AM books are listed on Amazon US for 2015; for 2016, the number is 474. The morning after I did the research for this blog post, I clicked into a couple of news sources I like, and discovered, yet again, the power of tracking cookies. UPDATE 12/22/16: Harry Bingham's two posts have resulted in a demand by Austin Macauley's solicitors that he remove all mention of them from his website. He is not backing down. "In our view, the instant resort to threat is a classic telltale sign of firms whose business practices fall on the wrong side of the ethical tracks." Author and writing teacher Jurgen Wolff also received threats of legal action as a consequence of posting information about Austin Macauley. UPDATE 6/5/17: Oh dear. Austin Macauley has decided that it's being bullied by big bad SFWA. Next, it posted a long, long (long) screed accusing me, Writer Beware, and SFWA of "Bullying, Insults, and Lies"...and worse. With footnotes. Racism, sexism, #bullying & abuse - THIS is the real #SFWA https://t.co/fIKG5n34Fd It makes for an uncomfortable read. You have been warned. Due to harassing behavior towards potential members, members, volunteers, & staff, we're blocking the publisher, @austinmacauley. The winner will receive AM's "standard traditional contract," which has serious defects, as outlined above. Also, as outlined above, pay-to-play publishers don't have much reason to invest in quality editing, marketing, distribution, etc., so even if you don't have to pay, publication may not be a prize worth winning. UPDATE 8/24/17: AM is doubling down on its defamation of SFWA (among other things) in a new essay defending its business practices. If you have to devote an entire article to denying that you "trick and swindle authors", claiming that you don't work in a virtual office, and debunking negative employee comments on Glassdoor, you've already lost the PR war, in my opinion. We have thought long and hard about where things are with Torquere and made the very hard decision that we need to begin the process of closing this chapter of our lives....We have done everything we could to turn things around but with the saturation in the industry, the financial hardships we are in, my health in constant decline along with the negativity we have had hurdled our way. We feel like we are currently fighting an uphill battle. Trouble at Torquere (which had been in business since 2003 with no problems) surfaced in early 2016, a little more than a year after Boulware and Talbot took it over. Reports of royalty payment problems began to proliferate, even as Torquere participated in Twitter pitch contests to find new manuscripts. During the summer, Boulware was arrested on a hot check charge, allegedly after payment to one author bounced. (UPDATE: the charge was dismissed on December 13 after Boulware posted a cash bond of $10,150.50.) In November, communication stopped completely, with neither Boulware nor Talbot answering authors' emails or responding to Facebook messages. Ominously, both co-owners removed "Torquere" from their Twitter handles and bios. Now the other shoe has dropped. According to the email, which was sent to all Torquere authors, writers will receive rights reversions, a process Boulware anticipates will take at least 90 days. As for when (or whether) they'll get the royalties they're owed...well, on that issue Boulware is vague. "We are still looking at options on how to get everyone paid," she says. Hmmm. The rights reversions will revert rights only to authors' originally-submitted text. "You will not be allowed to keep your cover art, ISBNs, or final edited versions of the books." Obviously ISBNs can't be re-used, and most publishers keep copyright to cover art (which they furnish at their cost)--but claiming copyright on edits is not the norm. Unfortunately, it's something I'm seeing more and more of in small press contracts--even though it's a pointless (how does the publisher benefit by keeping a death-grip on editorial revisions? ), burdensome (since the author must re-edit an already-edited work), predatory (since revisions are typically done by authors themselves at editors' suggestion), and likely not even legally defensible practice. I consider it a contract red flag. Is the copyright claim on editing even in the Torquere contract? I've heard of publishers that have made this claim on reversion, despite no contract clause allowing them to do so. Looking back through my files, I see that I've never actually seen a Torquere contract. Anyone want to share? I'd be interested to know if that language is in there. Torquere authors, please let me know if you are receiving reversions--and if you are getting paid. All information shared with Writer Beware is held in confidence. I'll update this post with any new information. UPDATE 12/15/16: I've now seen several Torquere contracts, which do not include any copyright claim on edits. I've also been informed by several authors that Kristi Boulware has offered some clarification on what's meant by "final edited versions of the books." Responding to questions in Torquere's Yahoo group, she confirmed that this doesn't mean the text, but rather the formatting--in other words, Torquere is not claiming copyright on edits, just the final formatting of the book. I don't know why this wasn't made clearer in the "we're closing" email, but there you go. UPDATE 12/18/16: Per documentation that I've seen, Boulware is not claiming copyright on the final edited text of published books whose rights she is reverting. She is, however, forbidding writers to use edited text if their reverted books haven't yet been published. If your book is NOT released and you have received edits from your editor. [sic] Then you are expected to not use those edits. We are being billed for edits on manuscripts under contract and those edits should not be taken elsewhere when that contract was voided since it was never finalized with Torquere. UPDATE 2/18/17: I'm hearing from authors who are still waiting to receive their rights reversions. Trouble at Tate: Could it be End of Days for America's Most Prolific Vanity Publisher? NEWS FLASH: on May 4, 2017, Oklahoma Attorney General Mike Hunter filed eight felony charges and one misdemeanor charge against Ryan and Richard Tate for alleged fraudulent business practices. A summary of this extremely long post: so-called Christian vanity publisher stiffs authors, staff, and creditors; gets sued for millions of dollars and fails to show up in court; goes bust with no notice; and rises from the dead to seek new victims, only for the founder and CEO to get arrested a couple of days later. The tale unfolds in my initial post and the dozens of updates that follow. Most recent news is at the bottom. Since putting this post online, I've received dozens of questions about whether there's a class action lawsuit against Tate. To my knowledge, the answer currently is no. I don't think that's the best option, anyway, because given all the complaints by authors and staff of non-payment, not to mention the two multi-million default judgments, I'm guessing that Tate has few resources to tap for restitution. Instead, I am still strongly encouraging authors to file complaints with the Oklahoma Attorney General's Office--even now that Ryan and Richard Tate have been arrested and charged with crimes. The Oklahoma AG is still looking to hear from Tate victims, and it's not too late to join the over 700 complainants from whom the AG has heard since the beginning of the year. More complaints will provide more evidence the AG can use, and will also add your name to the list for restitution, if there is any. This is a developing situation; see the updates at the bottom of this post. It's hard times lately for "America's Top Publisher," a.k.a. 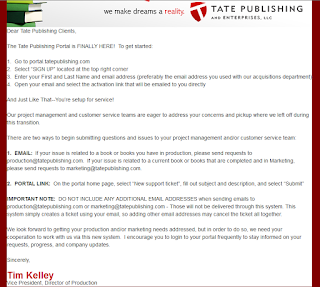 Tate Publishing & Enterprises, a.k.a. one of America's most prolific vanity publishers. Tate has been on Writer Beware's Thumbs Down Publishers List since the list was created. Not just because it charges enormous fees (an initial $3,990, with the option of paying hundreds or even thousands more for extras such as video trailers, custom websites, self-ordered books, and the like), but because it presents itself as a "mainline publishing organization" and doesn't reveal its fees anywhere on its website or in its promotional videos. In fact, Tate's website specifically promises that authors do not have to pay to publish: "Tate Publishing does not charge a fee for publishing and absorbs all the cost of production and distribution of a book." But this is classic vanity publisher doublespeak. Deeper into the submission process, when Tate finally gets around to asking authors to pull out their credit cards, they are told that the money is for a publicist. Clearly, Tate wants authors to assume that it's as traditional as traditional can be. And they do. Writer Beware has gotten hundreds of questions and reports from authors who approached Tate in the belief that it was not a vanity publisher. The Better Business Bureau, which as of this writing has logged 134 complaints over the past three years, yanked Tate's accreditation earlier this year. The Xerox lawsuit spurred layoffs from Tate's printing plant, even before Xerox began re-possessing its equipment in late July. And that's not all. Tate is facing at least four additional legal actions: a lawsuit by an author who claims that she paid over $12,000 for a book that was published full of errors (twice); a petition by a musician suing over copyright laws (a customer of Tate Music Group, which also runs on a vanity model); a claim by memorabilia manufacturer Jostens, which alleges that Tate owes it more than $13,000; and another by the property company that leases Tate its print shop (vacant now that Xerox has re-possessed its equipment), which alleges that Tate owes nearly $20,000 in rent. If that weren't enough, Tate's employment practices are being investigated by the Department of Labor. (Some employees say that they were threatened and "coached on what to say" by CEO Ryan Tate before Labor Department investigators came to interview them; this would not be the first time that Ryan Tate has threatened employees.) And per an (uneverified) comment on one of my previous posts about Tate, Tate may recently have been evicted from its offices. Are these the straws that broke the camel's back? Has Tate reached its very own End Times? Either way, it's not looking good for "America's Top [Vanity] Publisher." Hmmm. I think some Tate authors would disagree. UPDATE 12/22/16: I'm getting a flood of emails and comments not just from Tate authors, but from Tate staffers in the Philippines (you can see some of the comments below). Here's what I'm hearing. - Apparently Tate's Philippine workforce once numbered close to 1,000, but massive dismissals have seriously reduced this. The consensus seems to be that around 80% of staff have lost their jobs since October. - Unpaid or part-paid salaries and bonuses; apparently corporate headquarters in the USA hasn't been wiring enough money to cover payroll. - Staff complaints filed with the local Labor Department, citing salary disputes and dismissals without the required 30-day notice. - Production halts and slowdowns have put books in limbo, since there's no longer sufficient staff to work on them. - Resignation of high-level corporate staff in the US. - Silence on these issues from corporate headquarters. The Philippine staffers I've heard from are convinced that Tate can't survive much longer. Several have told me that they suspect that the Tates are shifting assets to a new company called Lux Creative Concepts LLC, which was registered in February 2016 by Ryan Tate's wife, Christy Kelley-Tate. "Tate Publishing has officially shut down their business in the Philippines today. Their main office in Cebu has been locked up by the Department of Labor and the owner of the building due to non-payment of the rent." "I'm an ex-employee of Tate, and we were just at the Cebu office yesterday. Today is the the last day that the office is open, mainly for HR to furnish ex-employees with certificates of employment and other documents. The Department of Labor has officially ceased all operations and is taking stock of the company's physical assets. We have been informed that, as of this writing, there is no official directive or announcement from the Tates that the company is closing or declaring bankruptcy." UPDATE 1/12/17: More on the Philippines debacle from an Oklahoma-based blog that has published a lot of articles about Tate's shenanigans. A former Tate staffer in Tate's now-closed Cebu offices describes partial payment of salaries, non-payment of government-mandated bonuses, and other problems dating back months. 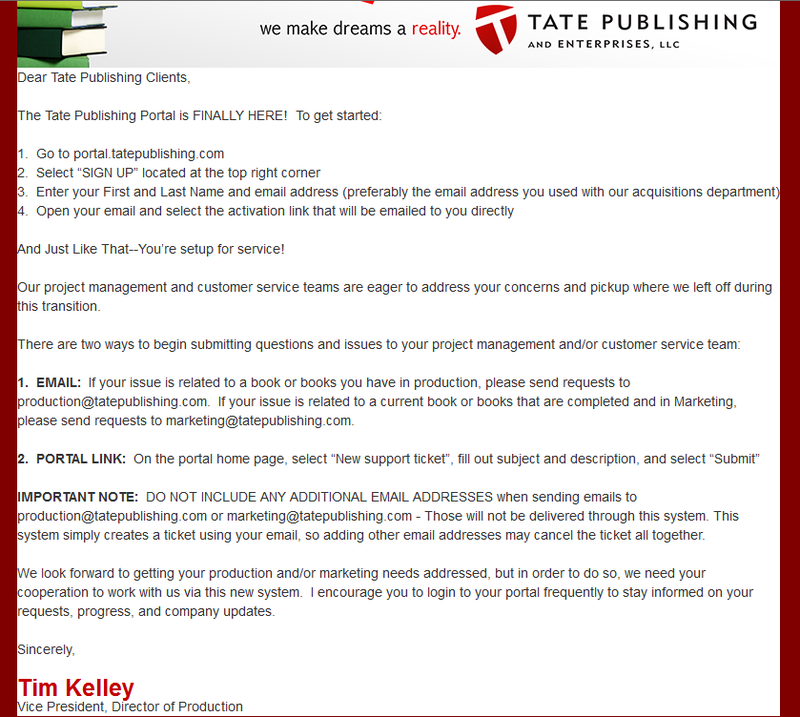 UPDATE 1/14/17: Some Tate authors report receiving an email signed by Tate's Director of Production, Tim Kelley, claiming that Ryan Tate hasn't paid employees and "your book will never be finished." This email was reportedly followed, within a couple of days, by another email claiming that the first email was the result of "identity theft" and its allegations aren't true. Things are fine, folks, just fine. Never mind the mass layoffs of employees. Never mind the lack of payment and non-communication. It's all just a transition. I'd love to hear from Tate authors who sign up for the portal. Have you received any results from your "new support ticket"? UPDATE 1/16/17: There's now a forum for Tate authors to share experiences and support: Tate Publishing Help. UPDATE 1/18/17: The Xerox lawsuit goes to court on Friday. "Meanwhile, it was unclear Tuesday who is representing Tate Publishing in the case. The firm's attorney when the lawsuit initially was filed was Richard L. Hasley, of Oklahoma City. But in September, an order was granted allowing Hasley to withdraw from the case, as he was retiring. Hasley was replaced by George H. Ramey and William D. Tharp, of Ramey & Tharp in Yukon. On Dec. 1, Ramey & Tharp submitted an application to withdraw from the case as Tate Publishing's representatives, as well, saying the Mustang publisher had failed to meet its financial obligations with the law firm." YET ANOTHER UPDATE, 1/18/17: I've now heard from several Tate authors and former US staffers that Tate closed down today. Two people have told me that it is considering a bankruptcy filing. Remember how I mentioned suspicions that Tate was shifting assets to a new company called Lux Creative Concepts, LLC, registered last February in Oklahoma by Ryan Tate's wife, Christy Kelley-Tate? Well, get a load of this. What looked like a fork in the road turned out to be the end of it for Mustang’s Tate Publishing this week, as it closed its doors for the last time. The news came Wednesday, just days after Tate co-founders Dr. Richard Tate and Rita Tate announced a consolidation of the company’s operations – the shutdown of its Philippines office and layoff of 50 employees there and a new focus on the company’s home base in Oklahoma. One of Tate family members’ primary concerns during the planned restructuring, and then as they faced the closure of their company, remained the company’s approximately 35,000 authors, they said. Work to help those authors make other arrangements was already underway and would continue as Tate worked with its attorneys to complete the closure process. I suspect most Tate authors will find that last paragraph bitterly ironic. ANOTHER UPDATE, 1/19/17: Tate's website now claims that it's "experiencing a transition period." There are links to click; if you do, you're taken to a release form requiring you to release Tate from legal liability and from providing "any refund or monetary compensation whatever." For authors whose books have already been published, there's the option of paying (!!!) a $50 "processing fee" to get final book-ready files. The bolded wording is interesting, because I've learned, via a former Tate employee, that Tate was issuing Lux Creative Concepts contracts simultaneously with Tate contracts during the final year of its existence. According to the employee, the Lux contracts cost a few hundred dollars more than the standard Tate contracts, and were for authors who wanted more media "extras". I've also learned, via an article published yesterday in Oklahoma paper The Journal Record, that yet another lawsuit has been filed against Tate: this one by Lightning Source, to which Tate routed its printing business in June of last year (the complaint can be seen here). Lightning Source, which alleges that Tate failed to pay for services rendered, is seeking $1.8 million: $722,000 (which it paid to Tate "for the exclusive rights to print and distribute at least five million, five hundred thousand (5,500,000) non-returned units of titles") plus an equal amount in damages, plus late charges. The lawsuit also names Ryan Tate, who signed a Personal Guaranty agreement by which he "absolutely and unconditionally guaranteed the full payment of all amounts due from Tate Publishing to Lightning Source". The timeline here is...interesting. Tate signed the agreement with Lightning Source on June 28 of last year--after Xerox, from which it had been leasing printing equipment, filed suit against it for non-payment and threatened to re-possess its printing equipment. Tate was probably desperate for a cash infusion at that point; it's hard not to suspect that it knew, when it signed the Lightning Source agreement, that it wouldn't be able to pay. Also... $722,000 is a sizeable chunk of change. What happened to it? As with the Xerox lawsuit (which is in court today), it's not clear who will be representing Tate, since both its previous lawyers resigned due to lack of payment. UPDATE 1/22/17: Quoth Richard Tate, according to this report from News Channel KFOR, "We love our authors. We are not going to abandon them." He also claims that "while [Tate] represent around 39,000 authors, this closing mainly affects the few hundred that have books not yet published" (forgetting, apparently, about the many who do have books published and haven't received royalties and/or book orders), and, in an apparent trip back in time to 2008, attributes the company's closing to "the downturn in the economy". UPDATE 1/23/17:Those of you who are considering giving Tate the $50 for your digital files should read this comment I just received: My book was ready to be printed so I made some serious attempts to convert the PDF to Word. Impossible. Tate uses a type of PDF called Acrobat reader DC and is proprietary to Tate. I have been doing a very slow page by page copy and paste finding out they have hidden tabs, margins, font and spacing. It takes about an hour to do one chapter that is presentable to my new publisher in Word 2010. Going through the copy and paste I find out I have 2 Chapter One's and several with no chapter numbers. After doing 5 chapters I found over 300 errors so the book wasn't worth printing any way. They use a Philippine font that is hard to change when you do a copy and paste. We are currently in negotiations with a number of publishing houses to find the best possible new home for all clients and titles we represent. Our primary objective is to find an appropriate home for our authors to ensure their success. In order to ensure successful negotiations, we are unable to comment further at this time. What does this mean? Is Tate seeking to sell its contracts? Will the new publisher or publishers honor existing contract terms? Will more money be due? Will authors (and musicians, since this affects Tate Music Group as well) have the opportunity to refuse? These are important questions with big implications. Please, everyone, keep the emails and comments coming, so I can continue to post updates. UPDATE, 2/2/17: Beware sharks in publishers' clothing. Lulu.com is okay, but Dog Ear Publishing is expensive and I've gotten a number of complaints about Outskirts Press's quality and service. If you're solicited by a publisher or publishing service, could you please let me know? I'd like to keep track. I'll also be glad to check my files to find out if I've gotten complaints about any publisher or service you're considering using. An attorney who represents a Tennessee-based printing services firm suing Tate Publishing in federal court for nonpayment filed an entry of default in the case on Friday. Attorney Evan Vincent, of Crowe & Dunlevy, said the entry of default was filed after the Mustang publisher and its president and CEO never responded to a summons they were served on the case in January. 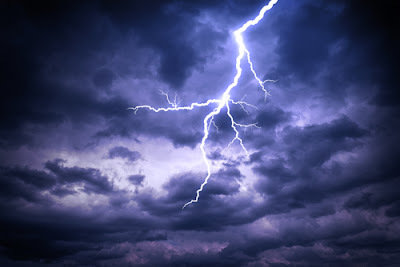 The entry of default clears the way for Vincent and his firm's client, Lightning Source LLC, to ask a federal judge to grant a motion of default in the case and to award Lightning Source the $1.845 million, plus interest, it seeks from Ryan Tate and his firm. Ryan, Ryan, Ryan. It's not looking good, especially since you signed a personal guarantee as part of your deal with Lightning Source. UPDATE 2/14/17: There's a Facebook group for ex-Tate authors and musicians where people are sharing experiences. If you're thinking of paying the $50 Tate is demanding in order to get your files, this may change your mind. One author who sent the money reports that Tate sent her back an empty envelope. Maybe this wasn't intentional to rip the author off (in that case, why send anything?). But even if it's just the result of incompetence or chaos, it reinforces the un-wisdom of giving Tate any more of your hard-earned money. 1. One of the interior pages had two headers, one appearing on top of the other (the actual title of the book appeared to be superimposed over the word “title”)...We were able to use some creative Photoshopping to fix that problem. 2. The second (and most disturbing) problem was that the Tate cover had no bleed on it. Without bleed, there is no wriggle room whatsoever for a printer during the cutting/binding process...Authors whose books don’t have a solid background would have challenges overcoming this problem using a flat pdf file (which is what Tate provides). 3. The text at the bottom of the barcode on the back cover was very pixelated and so was text at the top of the back cover....We were able to fix these errors in Photoshop as well but the quality of that text on the Tate version of the cover was truly awful. UPDATE 2/17/17: Remember when there was speculation that Tate might be planning to shift resources to a new company, Lux Creative Concepts? Turns out that probably isn't happening. I've discovered that Lux Creative (a registered business entity whose agent is Ryan Tate's wife, Christy Kelley-Tate) co-existed with Tate for maybe the last year of Tate's existence, with some Tate authors being offered contracts under the Lux Creative name. These contracts, apparently, involved more media "extras," and not surprisingly, were more expensive. However, I've been watching, and right now, other than its business registration, Lux Creative seems to be as dead as Tate. The Tates were serious enough about it at one point to want to give it a logo, though. Ever the big spenders, they hosted a design contest at 99Designs (a "graphic design marketplace" where companies pay as little as possible to desperate designers who bid on job postings). Here are the results. Am I alone in finding it funny that the winning entry got Lux Creative's name wrong? Another great business decision, brought to you by Tate. UPDATE 2/25/27: A federal judge just handed Lightning Source a default judgment in its lawsuit against Tate. As for what happens next in Lightning Source's case against Tate, the plaintiff will have to return to court to keep Judge Russell apprised on its efforts to collect what it's owed. Actions Tate Publishing and Ryan Tate could face might include liens against properties they own, garnishments of funds they have in banks, or other actions Lightning Source might take that the judge deems necessary and appropriate. Ryan Tate could be summoned to appear before the judge, and any failure to do so could prompt the issuance of a contempt citation. UPDATE 2/26/27: Well, we were all wondering when/if this would happen. And here it is: Lux Creative Publishing. The name's a little different--Lux Creative Publishing, rather than Lux Creative Concepts; and the domain name registration info has been anonymized to conceal the registrant. But the logo--the little torch rising from the book--is the same one commissioned by someone with the username "outate" from 99Designs (see my previous update). So I think it's safe to conclude that this is Tate, re-booting under a new name. UPDATE 2/27/17: Shortly after I posted the above update, the Lux Creative Publishing website ceased to be accessible. If you click the link now, you get a "This site has been suspended" notice. I don't know what it means, but I'm keeping an eye on it. Xerox has been granted summary judgment in its lawsuit against Tate, due in part to the fact that no one from Tate showed up to respond to the motion. Xerox can now proceed to collect nearly $1.5 million from Tate Publishing (good luck), over $450,000 from Ryan Tate (who provided a personal guarantee as part of Tate's arrangement with Xerox), and costs and attorneys' fees totaling more than $15,000. All with interest. Tate also owes a buttload of money to employees in the Philippines (no surprise there): $4,841,567 Philippine pesos, or nearly $100,000. The reported number of complaints received by the Oklahoma Attorney General currently stands at 621. That's a lot. Will the AG take action? No word on that as of now. 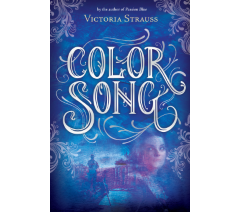 On her blog, former Tate author Heather D. Nelson is featuring interviews with Tate authors. UPDATE 4/4/17: As if it weren't enough that pay-to-play publishing services are stalking Tate authors, it appears that some Tate staffers are as well. 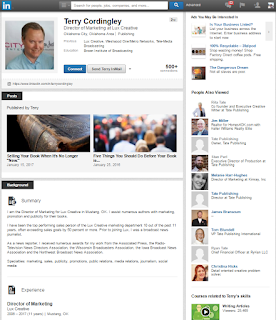 I've heard from authors who've been solicited by former Tate editor Liz Cormeros, who is offering "freelance project management", and also by former Tate Marketing Manager Terry Cordingley, who is plugging his blog and his "freelance publicity service." UPDATE 5/2/17: Incredibly, despite two seven-figure default judgments against it, nearly $100,000 owed to staff of its defunct Philippine operation, and who knows how many tens of thousands owed to authors in unpaid royalties and unfulfilled contractual obligations, Tate Publishing is back in business. Rumors of its resurrection have been circulating since late April, when some authors received an email from Ryan Tate (who, by the way, provided personal guarantees to both of the companies involved in those seven-figure judgments, and is personally on the hook for hundreds of thousands of dollars) announcing that Tate, like Jesus, was rising from the dead. Many authors suspected a trick or a scam--but as of today, Tate's website is live again (with no mention of its recent troubles) and soliciting submissions. Throughout this mess, I've said that I'd be astonished if Tate declared bankruptcy, because bankruptcy costs money and makes you accountable to your creditors. I expected Tate to simply disappear, or possibly start up again under a new name. So color me surprised to see this current zombie act. Where Tate will be able to find a new printer--having very publicly defaulted on its debt to Ingram, the biggest in the business--is an open question, as is how it will manage to stay atop its tide of debt with only the cash provided by new author victims. Stay tuned. Writer Beware will be watching. I've reproduced Ryan Tate's headshaker of an email in full below, replete with bogus excuses ("the economy hit us hard"), smarmy expressions of contrition ("I ask each of you to prayerfully consider finding it in your heart to forgive us"), ridiculous levels of understatement ("We...understand that the issues mentioned have caused some of you anger, frustration and confusion"), and multiple invocations of God ("These heartbreaking months have given us an opportunity to see God work in amazing ways and demonstrate His eternal love." Cue lightning bolt). How does he sleep at night? Thank you for your emails, calls and prayers during the recent months. I am sure you are aware we were forced to temporarily cease publishing operations in what was the hardest and most painful decision we have ever had to make as a family. Our number one priority has been to make sure each author is taken care of. Many publishers wanted to “take over” your books; however, in every case they wanted to charge you additional fees, didn’t offer the level of service or promotion necessary to succeed, and most importantly, didn’t line up with the philosophy of our publishing family. We spent countless hours researching the events which created our problems and issues related to marketing, distribution, and production. Securing the finest legal counsel made it possible for us to put a plan in place to resolve all the issues we were facing at that time in a proper and ethical manner. Finally, we established a plan for reorganization in order to reinstate full publishing, distribution, and marketing operations immediately. We are pleased to inform you we will be able to continue to take care of each of you and meet your expectations and needs as well as support you with your book project(s) – your life’s work. Another priority became very clear; that we establish a plan to assure this would not happen again. It was even clearer other publishers were out to take advantage of our situation. As we mentioned, they wanted to charge fees for work we had already completed for you. In our opinion, they fail to provide you with the partnership services it takes to have any chance at success in this industry. These heartbreaking months have given us an opportunity to see God work in amazing ways and demonstrate His eternal love. He has given us a renewed passion and desire to fight for each of you in humble dependence on Him. This experience and battle has given us the opportunity to evaluate what we must and will do differently to more effectively serve each of you as we go forward and make a grand comeback. We want to take this opportunity to make you aware of some changes as well as ask for your assistance. We are thankful for those who have reached out and asked us to reorganize and continue operations. We agree that the best home for you is where we all started this journey together. We sincerely want to remain your publishing home and family; to make you proud of our efforts; and proud that we are not going to quit. It is our desire to continue this journey together. With God’s help we will serve you better than ever before. Before discussing the changes we will make moving forward, I want to apologize. Hindsight is 20/20 and can often be a painful reality. As we look back on the last three years the economy hit us hard as it did everyone in America. None of us had the resources we had in the past and it forced us into what economists refer to as a “race to the bottom.” In an effort to keep volumes high and compete against other large publicly traded publishers we decided to set up overseas operations, and reduce pricing on all services. We now see that these decisions caused us to stray from the philosophies we established nearly 20 years ago when we first launched the company. Loss of control of our services, time frame delays in production and manufacturing, as well as our overall customer service experience was negatively impacted by these changes. I ask for your forgiveness. At that time we believed we were making decisions which would serve you best. We love you and understand that the issues mentioned have caused some of you anger, frustration and confusion. In many ways we have hurt you and let you down. It is difficult to admit these things, primarily because we desired to do and be the best for each of you. To have failed in these respects is painful for us and difficult to accept. I ask each of you to prayerfully consider finding it in your heart to forgive us and continue to work with us. We believe we can once again lead the publishing industry with publishing options authors need. For almost 20 years we led the publishing industry in innovation and creative services no one else dared offer. That made the entire industry better and we need your help to continue that path of innovation and discovery. If Tate Publishing ceased to exist we believe it would create a significant vacuum in the publishing industry. Once again, please accept our apology. We pray you will forgive us and give us a renewed opportunity to move forward as we strive to be stronger than ever before for your benefit and success. We want to continue this partnership journey and ask you to allow us to prove ourselves to you. We not only ask your forgiveness for any and all issues, but ask that you see this letter as our unwavering desire to fight for your success no matter what the obstacle. Our greatest desire is to see each of you succeed - the most important part of our comeback. The following are the changes you can expect from us as we move forward. Improved communication and fast response to your phone calls and emails. No production, marketing, distribution, or other work will be done outside of the United States of America. New national book manufacturing partners ensuring highest quality, additional manufacturing options, and timely order fulfillment. New marketing representatives for each author who will be expected to assist each author with events and methods to sell the author’s book(s). We will not be accepting unsolicited manuscripts. Our primary focus right now will just be YOU. We want to ensure that current Tate authors are receiving the care and assistance they need and we have one of the best and most dynamic family of authors in the industry. We want to serve you first and build everything around helping you find success. As we have been praying about how to best serve each of you and reorganize our publishing operations I have been amazed at how much we not only want to improve on our services, marketing and distribution options for each of your titles, but I have been primarily overwhelmed with how much we love being your publisher. We feel called to do this and our focus, motivation and desire to serve you has never been higher. My father came in my office a couple weeks ago as we were working on the plans and process for everything and he handed me a quote he often recites. UPDATE 5/4/17: Oklahoma Attorney General Mike Hunter filed eight felony charges and one misdemeanor charge against Ryan and Richard Tate for alleged fraudulent business practices. Charges include four felony counts of embezzlement, one felony count of attempted extortion by threat, two felony counts of extortion by threat, one felony count of racketeering and one misdemeanor count of embezzlement. FOR FURTHER UPDATES ON TATE PUBLISHING AND LEGAL PROCEEDINGS AGAINST RICHARD AND RYAN TATE, SEE MY MAY 4, 2017 POST. A roundup of publishers about which I've recently received serious complaints (all of them documented). At the end of 2014, the founders of Torquere Press--a well-regarded small publisher established in 2003--turned the company over to new co-owners: Kristi Boulware and Joanna Talbot. In an early September email to authors, Boulware admitted that Torquere was suffering "financial setbacks since losing several of our top-selling authors." Funds were "the lowest they've ever been" and the company was "trying to obtain some business funding to assist with meeting all of TP’s financial obligations." As of late September, things hadn't gotten better...but, per an update posted in the Torquere authors' Yahoo group, "We are staying positive and will be sending out at least partial payments as we are able to." Those payments never showed up, according to multiple complaints received by Writer Beware (allegedly, Torquere owes one author more than $18,000). In November, communication stopped completely, with neither Boulware nor Talbot answering emails or responding to Facebook messages from authors asking about money owed or seeking rights reversions (Torquere apparently has responded to some reversion requests, but ignoring others). Both co-owners also have removed "Torquere" from their Twitter handles and bios. No matter how you look at it, that's not a good sign. Meanwhile, Torquere remains open for submissions, with active anthology submission calls. Given the serious and apparently escalating problems at Torquere, I'd advise authors to stay away. UPDATE 12/13/16: Torquere is closing. They promise rights reversions but are vague on when (or if) writers and staff will be paid. Details in my followup blog post. Caliburn Press consists of seven imprints. Only three appear to have actually published any books--including Damnation Books and Eternal Press, which Alan Leddon, then of Spero Publishing, acquired from former owner Kim Richards Gilchrist in 2015. Leddon then consolidated Damnation and Eternal with his other imprints under the Caliburn name. Damnation/Eternal was a problem company. Writer Beware received many complaints about its lack of professionalism, with authors citing poor editing, minimal marketing, uncompetitive pricing, and, late in Gilchrist's ownership of the company, missing royalty statements and payments. Damnation's contract paid royalties on net profit, and imposed huge early termination fees--both red flags that I've warned about repeatedly on this blog. I posted a warning about Damnation in 2013 after one author sued the company for inserting hundreds of errors into her published book and refusing to publish a corrected version. Here's another author who had to take legal action. And the Damnation Books thread at Absolute Write is loaded with complaints. When Gilchrist unloaded Damnation/Eternal in September 2015, authors were hopeful that Alan Leddon would make a good-faith effort to fix the problems. Unfortunately, the situation only seem to have gotten worse. In early 2016, Writer Beware started getting familiar-sounding complaints of non-payment--not just from authors this time, but from staff. Other complaints included repeatedly-delayed publication dates, bad editing, high staff turnover, poor financial management (in an April email to authors, Leddon denied embezzling funds, but admitted that "some money is missing from business accounts"). To authors' fury, Leddon also attempted to expand the net profit royalty calculation in Damnation/Eternal contracts to enable him to deduct not just printing costs, but also cover art, ISBNs, copyright registration, and a raft of other expenses. 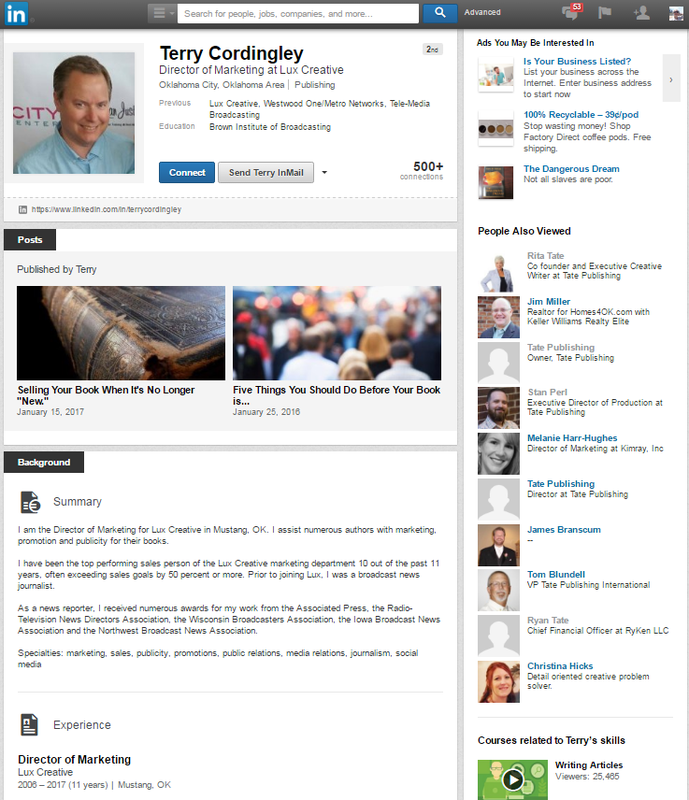 In April (the same month Leddon felt he had to deny embezzling company money), gobsmacked Caliburn authors got a solicitation to contribute a GoFundMe campaign set up by Leddon, through which he hoped to establish a brick-and-mortar "spiritual bookstore" where, among other items, their books would be sold. In a maybe-too-candid description of the campaign, Leddon revealed that he was "living on government benefits and an occasional few dollars from the publishing company that I started five years ago" and admitted to "years of my publishing company making less per quarter than the cost of a tank of gas". Not very reassuring for all the authors who had hoped their new boss had the resources and expertise to turn things around. As of this writing, complaints continue to come in. Caliburn Press is still open to submissions. Writer beware. Last July, I wrote a long post on the troubles at Month9Books, which had just scaled back its author list amid multiple complaints of lack of payment (for staff as well as authors), delayed publication dates, broken marketing promises, overcrowded publication schedules, communications breakdowns, problems with royalty accounting, and alleged harsh treatment and/or bullying by Month9 owner Georgia McBride. McBride pledged to work on the problems and make Month9 great again (sorry, couldn't resist). Unfortunately, Writer Beware is still hearing from authors who say they haven't been paid, haven't received royalty statements (or have received strange or incorrect ones), and have been on the receiving end of angry responses from McBride. Two Month9 authors have filed suit against the company, alleging nonpayment and seeking return of the rights to their books. Despite these issues, and the fact that overstuffing its publication list was a major source of its troubles, Month9 continues to acquire titles. Writer beware, again.